This Mara mug is perfect for the snow skier in your life. As they set back enjoying that hot mug of coffee or hot chocolate they can reminisce about their last ski trip down their favorite mountain. 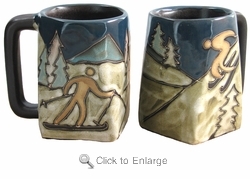 We also offer a 16oz round bottom Skier mug at Mara Mug - Skier 16oz. You can see all Winter Designs here Winter Designs.